Diagnostic Laboratory of Oklahoma (DLO) and UnitedHealthcare have established a new network relationship, giving Oklahomans enrolled in UnitedHealthcare health plans access to DLO patient service centers beginning Oct. 1, 2017, for Medicare and Jan. 1, 2018, for employer-sponsored and individual plans. UnitedHealthcare serves nearly 415,000 Oklahomans enrolled in employer-sponsored, individual, Medicare and Medicaid health plans with a network of 146 hospitals and more than 11,500 physicians and other care providers statewide. Diagnostic Laboratory of Oklahoma is an Oklahoma-based medical laboratory that each day provides innovative, timely, and quality medical laboratory testing and services to thousands of Oklahoma healthcare professionals and patients. Through the company’s affiliation with Quest Diagnostics – the world’s leading medical lab – DLO offers the high-quality, cutting-edge testing and services you expect from a global leader with the added service and convenience from working with a local medical lab. In fact, 95% of DLO’s tests – more than 13 million a year – are conducted in their Oklahoma laboratories. For more information, visit DLO at www.dlolab.com or @DLOlab on Facebook or @YourDLO on Twitter. Oklahoma State Senators A.J. Griffin, R-Guthrie, and Stephanie Bice, R-Oklahoma City, recently visited Diagnostic Laboratory of Oklahoma (DLO) in Oklahoma City. 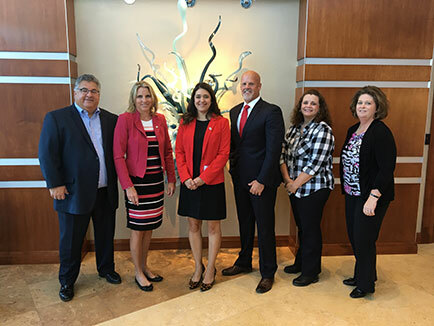 The senators sat down with Dennis Hogle, DLO’s CEO and General Manager, and other DLO staff to discuss the benefits of DLO to the state of Oklahoma and the challenges facing DLO and the lab industry. The senators also were given a tour of the central laboratory. Sen. Griffin is a life-long Oklahoman with strong ties to business, education and nonprofit work. She gained business management experience working in the restaurant industry, and eventually entered education, sharing her professional knowledge by becoming a teacher and hospitality careers instructor. Those experiences merged when she began a new career managing non-profit organizations dedicated to improving the lives of Oklahoma children and families. Sen. Griffin was first elected to the State Senate District 20 seat in 2012, and previously served as Vice Chair of the Senate Republican Caucus and now serves as Chair of the Rural Caucus. She has worked to write and pass legislation to address Oklahoma’s fastest growing substance abuse issue—prescription drug addiction. Sen. Bice was elected to the Oklahoma State Senate in 2014. She represents District 22 which is comprised of northern Oklahoma County and eastern Canadian County, including parts of Edmond, Deer Creek, Piedmont and Yukon. As a native Oklahoman, she worked for eight years for her family's technology company before becoming Vice President of Business Development for Smirk New Media, a digital marketing agency located in Downtown Oklahoma City. This experience has allowed her to be keenly aware of the challenges small business owners face in Oklahoma. Sens. Griffin and Bice were greeted by members of the DLO leadership team during their visit. Shown above are (left to right) Executive Sales Director Jeff McCown, Sen. Griffin, Sen. Bice, Hogle, Chief Compliance Officer June Phillips, and Chief Information Officer R'Nee Mullen. Diagnostic Laboratory of Oklahoma (DLO) understands the urgency of health issues that face all Oklahomans. Whether that's health conditions such as heart disease, obesity, or diabetes, the shortage of physicians and hospitals serving our rural communities, or the challenges of understanding insurance plans, DLO wants to be part of the solution to fix these problems. To help bring awareness to these issues, DLO chose to be the presenting sponsor for "State of Health", a statewide health special that aired on KWTV News 9 in the Oklahoma City market and on KOTV News on 6 in the Tulsa market. This two-night program featured stories on the current state of Oklahoma healthcare, covering subjects such as Oklahoma’s health scorecard, diabetes, mental health, doctor shortage, and health insurance issues on the first night, while the second night focused on ways to get healthy, including health fads, exercise, dieting, and other ways to improve your overall health. "We felt this was a great way to show the people of Oklahoma that DLO cares about our state's overall health and wellness and how we're playing a part in changing the trend," said Dennis Hogle, DLO's CEO. "With more than 50 patient access points across Oklahoma, including many in rural towns and cities, DLO has more locations than any lab provider in Oklahoma, providing superior access to the quality laboratory services our citizens need." Visit www.news9.com/category/327122/state-of-health to view the State of Health special. Congressman Steve Russell (R-OK-5th district) recently visited Diagnostic Laboratory of Oklahoma (DLO) in Oklahoma City. He took a tour of the lab and sat down with Dennis Hogle, DLO’s CEO and General Manager, to discuss a number of challenges and topics facing our industry. An Oklahoma native, Rep. Russell served in the U.S. Army for 21 years, retiring as a Lieutenant Colonel. He was first elected to Congress in 2014 and is a member of the House Republican Steering Committee; House Committee on Government Oversight and Reform (Vice Chair of the Subcommittee on National Security) and House Armed Services Committee. Rep. Russell was greeted by the DLO leadership team during his recent visit to the lab. 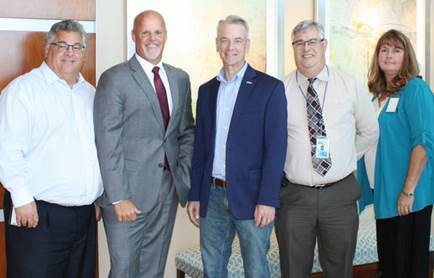 Shown here are (left to right) Executive Sales Director Jeff McCown, Hogle, Rep. Russell, Chief Financial Officer Leo Sell, and Chief Operations Officer Kim Holloway.